D7 can deodorize and disinfect many surfaces. Application is applied via fog, foam, mist or direct spray directly on porous and non-porous surfaces, fabric, and walls. Non-toxic, non-corrosive and non-abrasive. Offices, warehouses, basements are susceptible to odors and bacteria outbreaks. D7 performs to clean up these environments. Keeping our public buildings and environments healthy is key to overall satisfaction. Reduce school absentees, enhance employee productivity and maintain a healthy environment. Realtors, property management, custodial maintenance, and apartment complex managers. Homes, apartments, gyms, hotels, schools, churches, assisted living, medical, hospitals and commercial buildings. Mobile homes, RVs, boats, vans, trains, buses, storage sheds, enclosed trailers, and crawl spaces. Pet odors, debris, waste, urine, feces, and contamination. D7 is versatile and safe with many applications. D7 is a Bactericidal and Broad-spectrum disinfectant that delivers complete inactivation of Staphylococcus aureus (ATCC 6538), Salmonella enterica (ATCC 10708), Pseudomonas aeruginosa (ATCC 15442). Unlike alternate disinfectants, D7 chemically changes the osmotic pressure around the cell, which causes an imbalance in the internal cellular pressure resulting in the total collapse of the cellular membrane. This product can be applied through foaming apparatus, low-pressure sprayers, mopping, and soaking systems. Food processing plants, USDA inspected food processing facilities, farms, dairy farms, hog farms, equine farms, poultry and turkey farms and egg processing plants, meat/poultry processing plants, meat/poultry producing establishments, mushroom farms, rendering plants, canneries, caterers, bakeries, meat packing plants, hide and leather processing plants. Processing facilities for Fish, Milk, Citrus, Wine, Fruit, Vegetable, Ice Cream, and Potatoes and beverage plants. This product kills Pseudomonas aeruginosa, Salmonella enterica, and Staphylococcus aureus and helps reduce cross-contamination on treated non-food contact kitchen surfaces. A potable water rinse is required after application on food contact surfaces. D7 is a Bactericidal and Broad-spectrum disinfectant that delivers complete inactivation of Staphylococcus aureus (ATCC 6538), Salmonella enterica (ATCC 10708), Pseudomonas aeruginosa (ATCC 15442). When products are tested for their ability to kill germs, bacteria and viruses, the terms “log kill” or “log reduction” are used to describe their effectiveness. D7 is based on a patented, multi-part aqueous solution including hydrogen peroxide and an advanced four-chain quaternary ammonia formulation developed by Sandia National Laboratories. Soapy water has long been a basic means to cleaning contaminated surfaces. D7-MPC is operationally straightforward, and diluted with water to provide the overall cleaning of heavy soil load environments, including barns, buildings, trucks and farm equipment. It is biodegradable, non-corrosive, and requires no special applicator. 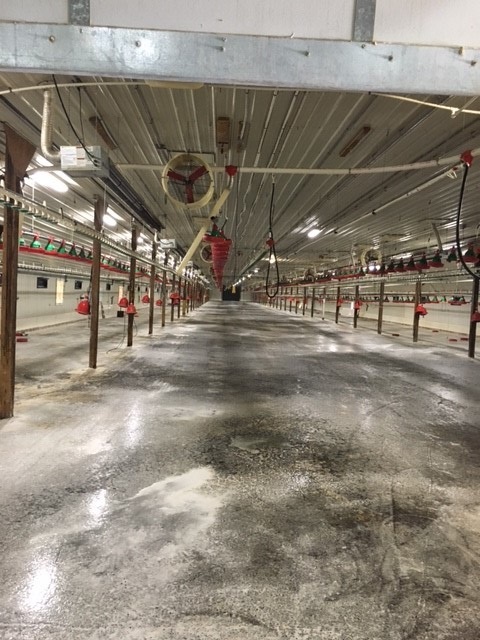 Specifically designed for poultry barn clean outs and disinfecting through a foaming action. Foaming upon surfaces of disinfectant chemicals, provides better contact time and assures cleaner environments . The poultry foaming trailer is designed to cover entire surfaces including vertical walls, ceilings and floors. The versatile boom is engineered for a one person operation, including a wireless remote shut off of the entire system. Biosecurity for the transport of livestock via trucks and trailers, is critical to assure minimizing or eliminating the spread of bacteria and disease. JBI has developed a complete solution to address the areas of truck bay wash outs in these facilities. Includes foaming applicators, wash out mixing dispenser and a metering of your disinfectant product and soap. Based in the heart of the American Midwest, LumenPros was founded on the fundamentals of technology, value and customer service. Our principles have owned and managed multiple lighting manufacturers and have a combined 40 years in the specialty lighting industry. LumenPros products, under the Brands of Agricultural Lighting Sciences and SafeLUM, utilize engineered optics, high quality and efficient LEDs with spectral distributions tailored for each specific application to provide balanced, smooth light. The rubber in these boots contains an antibacterial compound that fights away the bacteria of the day. Quick and easily spray down your boots and let them rest while they clean themselves. One less thing to deal with.